The Iyanden Eldar in their craft world spaceship hold off the invading Tyranids. 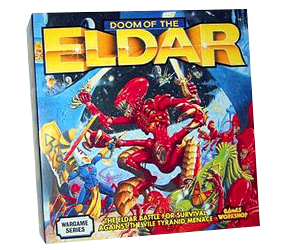 The last in the trilogy of counter wargames produced by Games Workshop in the early nineties, here Tyranids swarm an Eldar craftworld in the vastness of space. A great cardboard-counter, cross-index-the-odds-ratio wargame, from back when logos were airbrushed, not Photoshopped!